Please allow time for photos to load, Great Buy! Taylor by Laura & Don Paulino! 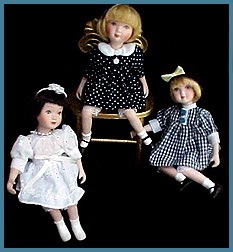 For this auction you are bidding on the doll in navy polkadot dress in the front with pale blonde hair and a headband with a navy bow. Almost 10 inches tall seated, she has a look inquiry?? 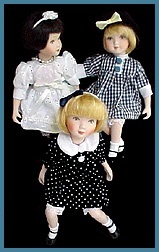 She wears a cotton navy dress with white polkadots, white collar with matching covered buttons and white cotton pantaloons trimmed in lace. Her white headband is removable and she had a navy blue bow attached to her hair (which could be removed). Her legs and arms are attached with heavy cord, and she can easily be placed in natural poses! Her head is jointed as well. The shoes and sox are sculpted and painted. 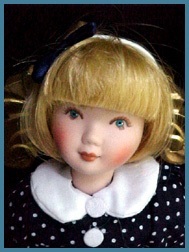 Although named Taylor by her creators, Don and Linda Paulino, there is no indication of the name on the doll or the box, therefore she is suitable for any child if you would like to personalize her. Was $25.99 now only $15.99! New from gallery stock. She comes in her cellophane window storage box and a certificate of authenticity.